First, should this new conceptual space/category actually be part (a new category added to the usual categories of discrimination and proportionality of means) of jus in bello in Just War Theory? 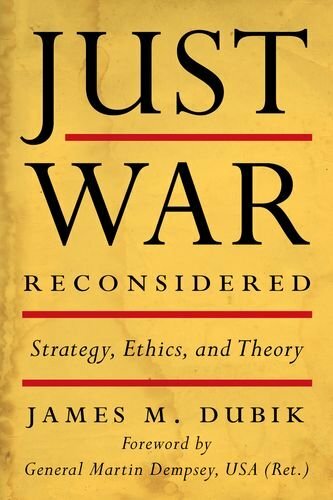 Traditionally jus ad bellum considerations and judgments are the domain of the political leadership (in the case of the U.S., civilians, with input and advice from senior military) and the jus in bello considerations are the domain of the military (with the assistance of lawyers). Dubik argues the conceptual space he has identified is a missing element in the jus in bello part of the theory, but I actually think it is a bridge and a link between the two and so deserves its own conceptual category. War waging seems to go back and forth and to share considerations, judgments and impacts on both jus ad bellum and jus in bello and therefore, a separate category (Justice of Waging/Management of War) would make more sense and highlight the importance of these ethical considerations in their own right and serve as a bridge between jus ad bellum, jus in bello, and jus post bellum. Pauline Shanks Kaurin holds a Ph.D. in Philosophy from Temple University and is a specialist in military ethics, just war theory, social and political philosophy, and applied ethics. She is Associate Professor of Philosophy and Chair, Department of Philosophy at Pacific Lutheran University and teaches courses in military ethics, warfare, business ethics, and history of philosophy.